Effective oral communication is required for success in the educational setting and is critical for success in the business world. Employers expect employees to continuously build on skills that involve critical thinking, solving problems, communicating ideas to others, and collaborating effectively. Many standards specify that students must be able to adjust their use of spoken, written, and visual language (e.g., conventions, style, and vocabulary) to communicate effectively with a variety of audiences and for different purposes. Understanding the interdependence between oral communication and the written language is essential to acquiring literacy. Educators suggest that English Language Arts courses must include curricula that can be used for teaching students to successfully learn the different functions of language including narrative, informative, and persuasive speech. The Speaking with Power Series includes three interactive multimedia programs that focus on giving narrative, informative, and persuasive speeches. The programs feature youth actors and include interactive instructional lessons with vignettes of examples and non-examples of skills and strategies, interactive flash cards, mnemonic devices, quick quizzes, interactive modules and games, color graphics, animation, video segments, audio effects, narration, and descriptive text. Contained on each CD is a video instructor’s guide that provides an overview of the program and information needed to implement the program. 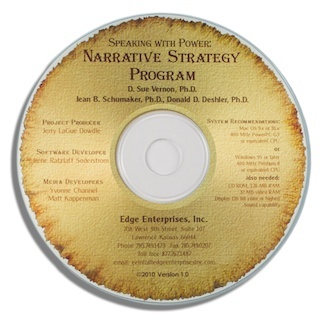 The Narrative Strategy program was designed for teaching students to deliver information orally after hearing a story. It enables them to sequence and cohesively present a series of events to their listeners. The program introduces the importance of communication protocols such as the use of gaze, body posture, intonation, and expression. It contains major instructional segments related to listening to and preparing to tell a story, learning to connect to an audience, and practicing how to tell a story. A special section enables students to generalize the skills to writing a story. The Informing Others program teaches students to listen, manage information, and present information in a variety of contexts. Their goal is to inform or teach. They learn to research a topic, organize the information according to main ideas, create a well-formed introduction (with an attention grabber), body, and conclusion, include supporting details (examples, reasons, and comparisons), and practice presenting the information concisely and smoothly. The Persuading Others program helps students become confident, well organized, and knowledgeable as they offer hope, inspire and motivate people. They learn to identify persuasive rhetoric (e.g., loaded words, testimonials), create a clear statement of position, distinguish between fact and opinion, present supporting details and compelling evidence (e.g., reasons, examples, statistics, anecdotes, emotional appeals), and choose persuasive words as they provide an introduction, a body, a summary and a final appeal. These programs serve as a supplement to traditional curricula and instructional methodologies or as a remediation tool for use with students with expressive language deficits. The programs are useable in a variety of settings to provide instruction and practice to ensure that students achieve mastery in communication skills by meeting standards and performance benchmarks for speaking. Settings might include English classes, language arts classes, special education classes, classes for English language learners, study halls, summer school programs, home schooling, or after-school programs. The interactive, multimedia CD format provides self-paced validated instruction to students. Each program has been empirically validated through a federally funded project.